The sun is barely up as fifty-odd runners gather for the Fort Ordnance 100K in Monterey, CA. The gun fires and they patter off, mentally setting their sights on the finish line 62 miles away. For one runner this race from dawn to dusk, literally outrunning the sun, is one she’s been on her whole life. A mysterious rash can be a sign of many conditions in a young child, but this one seemed different. None of the usual allergy treatments seemed to make a difference. Her doctors were baffled; none of them had seen anything like it. Determined to discover what was affecting their four-year-old daughter, Christina’s parents dived into research, eventually discovering its similarities to Lupus, an autoimmune disorder characterized by patients’ sun sensitivity. More specialist visits followed, tests that revealed an extreme sensitivity to ultra-violet light that triggered a host of symptoms: arthritic ‘flares’, hyper-vigilant immune response, eye inflammation resulting in scarring in her eye’s lens, skin irritations, and swelling of the covering of her joints. Finally, one of the most prominent physicians in the field recognized symptoms that he had seen in only eight or so other patients. Christina was diagnosed with an extremely rare autoimmune disorder: Early On-set Systemic Rheumatoid Arthritis. Despite doomsday prognoses from her doctors, Christina’s parents were determined to give their daughter every opportunity of living a long, healthy life. Management of her condition consisted of a trial-and-error process to find the triggers of flares, which eventually focused on preventing exposure to ultra-violet (UV) light. In other words: sunlight. It’s very difficult to imagine what it would be like know that the briefest exposure to direct sunlight would result in weeks of painful, damaging symptoms. For years after her diagnosis, Christina wore three layers of clothing in all weather, slathered herself with zinc oxide, and avoided any outdoors activity. Simply getting from a car to a building took planning to ensure she was not outside for more than a few seconds. At the age of nine, she underwent eye lens replacement surgery to remove the cataract. Throughout her elementary school years, she stayed inside during recess and lunch, and faced the skepticism of school officials, other parents and students, who found her condition difficult to believe. It wasn’t an easy time. Her condition marked her as ‘different’ to those who couldn’t understand how one could be “allergic to the sun”. Throughout her college years at Cal Poly San Luis Obispo, she continued to run to blow off steam. When her studies became too stressful, Christina would follow the advice of her high school track coach and take herself out for a run, rather than sit home and stew. The canyons surrounding the town, and proximity to her running idol, cross-country super- star, Jordan Hasay, inspired Christina to push herself physically at a time when many students are experiencing more of the ‘Freshman 15’ weight gain than a 15-mile run. fter graduation, Christina joined the ranks of grads looking for employment. Between interviews and applications, she continued to rack up the miles. Even after she accepted a laboratory assistant position at a prominent research institution, she kept running a priority, having found a peaceful haven in the quiet of the hills. A couple of years later, she came across a Runner’s World magazine article that inspired her to attempt her first marathon. The only trouble was that, since she had out-grown and worn out her HED suit, she had to restrict her running hours to dusk or dawn to avoid sun exposure. Confining her workouts to non-work, non-sunlit, non-sleeping hours was a challenge. Any marathon runner will tell you that training for the big 26.2 is difficult enough without the additional complications of having very limited window of training time, as well as the physical effects of running with arthritis. Having experienced first-hand how far she could push her body despite its conceived limitations, Christina wanted to help other children with Juvenile Arthritis (JA) learn to live life to the fullest. She volunteered at the Arthritis Foundation’s Camp Milagros and interned at the San Francisco office to design community health programs for those suffering with arthritis. “Interacting with children with various forms of Juvenile Arthritis made realize how lucky I was that I had a family that cared enough to support me in my crazy aspirations. Especially in getting health care support at a time when JA and its effects were relatively unknown,” said Christina. There are only a handful of nighttime marathons on the West Coast, so Christina chose the Las Vegas marathon for her debut. Over 40,000 runners flooded “The Strip” that December evening, running in near-freezing desert temperatures. Finishing in a respectable 4:35, Christina was exhausted, and on the brink of collapse. Once recovered, she began to reflect on what she could have done better to prepare for the next one. She joined a local running group, only to be slowly converted from road running to trail running, and then to ultra running. Moving into the realm of ultra running was a slow, but steady, process. She started with a few trails in local parks and then ventured further and further into the hills. Soon she was running 5-7 hours a day on weekends, covering an average of 70 miles a week. What motivated her on these runs is something that seems too simple to be true, but any ultra runner will agree: the peace that can be found on the furthest reaches of the trail, the sense of accomplishment at treading unfamiliar ground, the heightened awareness of the beauty found in all the little things in life. 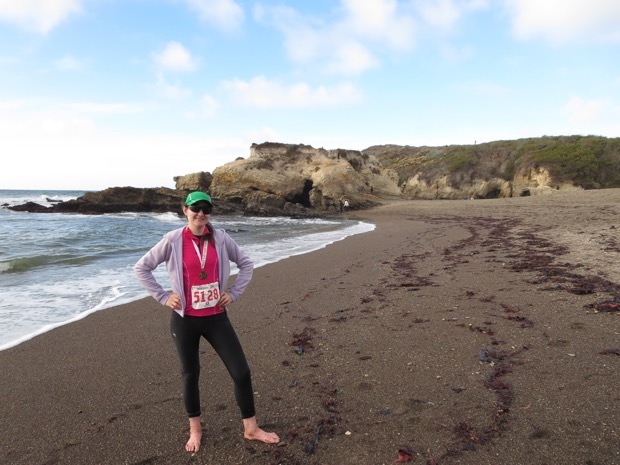 In her first ultra, the Spooner Cove 50K in Central California, she surprised herself by coming in as the first woman. Then, she won the Niscene Marks Marathon. As her strength and race savvy grew, she set her sights on longer distances. 2015 dawned – a new year, a new resolution. One hundred kilometers was further than she had ever run in her life. This meant that she would have to push herself to the extreme of her physical capabilities, while protecting herself from nine hours of sun exposure. Risky? Yes. But that never stopped her before. Her biggest challenge as she saw it was the mental aspect of pushing through the incredibly high mileage. If there’s one lesson to be learned from Christina’s experiences it’s that the right attitude makes all the difference, whether tackling a tough course at school, a difficult health issue, or a marathon. Fortified with head- to-toe SPF 50 technical running gear, salt tablets, and sipping Coke to combat nausea, Christina continued to push on. Mile 41 became 42, 43, 44…. The sun set behind the hills, at last giving her relief from the heat and allowing her to remove the protective clothing she had been wearing. Joints swelling and muscles burning, she fantasized about plopping down under a tree and gorging herself on fruit juice, but the lights of the final aid station twinkled out of the darkness and beyond it, the final six miles….